Rabbi Mansour is the oldest of five siblings born to Joseph and Rochelle Mansour, both of whose grandparents came to the United States from the Middle East. When young Eli reached schooling age, the obvious choice for a school was the renowned Magen David Yeshiva, which was founded by the Rabbi’s great uncle, the esteemed Mr. Isaac Shalom A"H, with the purpose of promoting Syrian Sephardic culture. There he studied Torah and absorbed the richness of our heritage from noted Rabbis such as Rabbi David Bitton A"H, and Rabbi Moshe Greenes A”H. However, the figure who had the most significant impact on the Rabbi’s development was Rabbi Baruch ben Haim A"H, our venerated community leader, who, as it so happened, had also taught Rabbi Mansour’s father in the same school. Rabbi Ben Haim imparted to the young Eli the glory of our heritage as well as our community's commitment to Torah. The Hacham also became the Rabbi’s address for Halachic questions and spiritual guidance. Rabbi Mansour continued his education as one of the founding students of Yeshivat Shaare Torah High School, where he was guided by his Rosh Yeshivah, Rabbi Hillel Haber. After graduating from Shaare Torah, he studied at Jeursalem’s Mercaz Hatorah, and then in the Bet Medrash Gavoha in Lakewood, New Jersey. After marrying his wife, he moved back to Brooklyn where he was offered the position of Rabbi at the Ahi Ezer Torah Center. His outstanding scholarship, clarity of presentation, magnetic personality and ability to relate to people of all levels of observance combined to make him an exceptional teacher and leader, who could show Jews from all backgrounds the joy and fulfillment that can be achieved through a Torah lifestyle. His rigorous schedule includes an early-morning Daf Yomi class, a daily Halachic discourse, an Ein Yaakov class to businessmen, and regular lectures at Ilan High School, in the synagogue and in the homes of community members. But for his many students and followers, the highlight of the week is Rabbi Mansour’s Shabbat afternoon drasha, which consistently draws more people than seats available. In addition to his lecturing and communal responsibilities, Rabbi Mansour continues to devote himself to intensive Torah learning, studying each day at the Keter Sion Kollel and in the Kollel Aram Soba. The popularity of his lectures has spread far and wide. Recordings have been distributed through out the world, and he is among the Torah world’s most sought after speakers, throughout the United States and in communities around the globe. 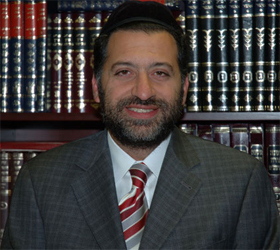 Rabbi Mansour is currently the Rabbi of Bet Yaakob Synagogue & Congregation in Brooklyn, New York, where he continues to spread Torah and provide inspiration. During the summer months, he serves as the Rabbi officiating at the Ohel Yaakob (Lawrence Avenue) Synagogue in Deal, New Jersey. B”H, the Bet Yaakob has purchased property in Brooklyn, and is currently in planning stages of a new larger facility that will be called The Edmond J Safra Synagogue when they move in 2016.